Looking for a one of a kind app, an app that could improve Twitter? Check out Rantable. It is a revolutionary way to get around the 140 character barrier. How many people out there have had a great rant, but couldn’t explain it, with just a few sentences? Do your rants go like this “Today I went to the mall. I was stopped by a Tom Cruise!! Then all of a sudden…” and you can’t finish it?! Well now there is a way. That way is Rantable. Rantable noticed a growing trend of people using Twitter to share the things that annoy them, or in other words they used Twitter to “rant”. When they analyzed this trend they found people were ranting about a whole range of subjects, from social benefits to parents and technology. What they discovered was Twitter is a great way to reach a huge audience of people, but it is not a good way to get instant tangible feedback of what people think of their rants, or other people’s rants. They also found that Twitter’s limitation of 140 characters, was too constraining for someone with either a solid researched point or comical story to tell. And most importantly they discovered it was impossible to see what annoyed people the most and equally important, which people were best at delivering rants. Because who doesn’t love a good rant? 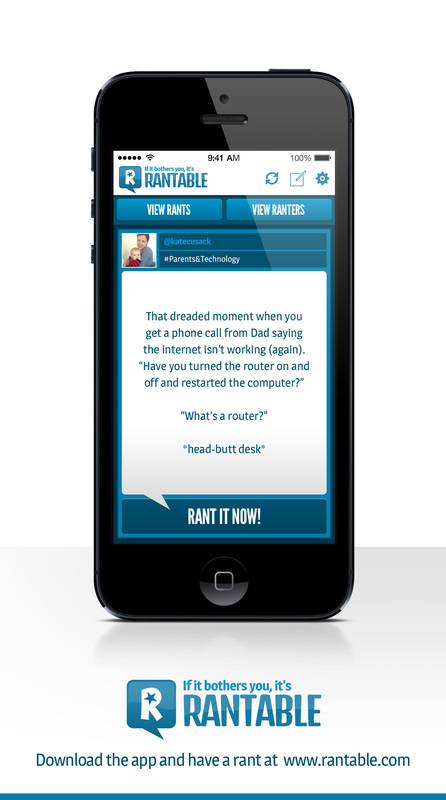 Rantable is an app that brings the gap between micro-blogging and tweeting closer together. Before if you wanted to express a well-researched point or argument, Twitter was simply not an option instead blogging sites were. However blogging sites do not come close in comparison with the audience range that Twitter has. Even a well-known journalist, writing for a well-established publisher would not get the same audience as Twitter. But Rantable fisgured out a way to bridge that gap; allowing 6,000 characters in any rant. Rantable is a tool for all Twitter users, its activity, which consists of posts and votes, are shared on Twitter. But best of all Rantable provides a ranking system. There so far has not been a common system for measuring what other people think of what has been written. So Rantable has implanted a 5 star system (universal to everyone) where anyone can rate what has been ranted about. The rating system allows the app to organize the posts by most voted or highest score, so it can easily be seen what is popular and ignore the rubbish content; very much unlike twitter. Rantable also gives the option to search for a topic that is particularly bothersome to any given person. So say if a ranter had a problem with Justin Bieber, they would have the opportunity to search his name, and unleash in a rant about him, in a matter of seconds. It can be seen by the rating system what is the best or most popular opinions, or basically just see the content with the most meaning. This is something that again is very much unlike twitter, where in Twitter you just see everything. Rantable will be of the hot new apps that becomes a sensation. There is no doubt about it. If Twitter exploded to the capacity that it did, why wouldn’t its “subtweet”? Click “Notify Me” to know exactly when Rantable hits the market!